Chris and Lorna's house, on the outside, needs attention. 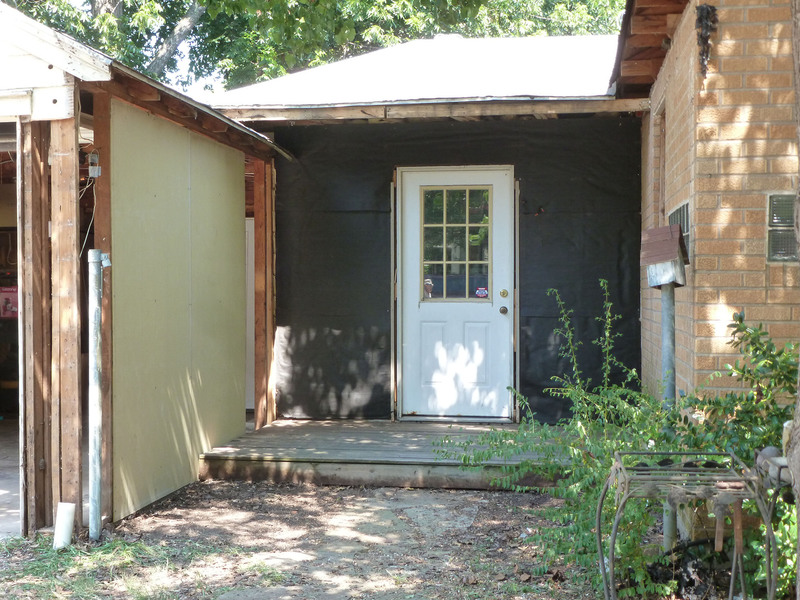 The side porch, the garage, and the back of the house are covered with siding that is itself covered with black mold and peeling paint. We could have spent a lot of time dealing with the mold and paint but instead we decided to take off the old and replace it with Hardie panels. The soffits in these areas also need replacing. But we figured out how to do that last Christmas when we worked on the front of the house. It goes faster when you have a clue as to how to do something. We have finally hit the 100s in Texas. I am so very thankful that Chris has big trees and we mostly are working in the shade. You have no idea how much that helps. Or maybe you do know. All it takes is working out on a hot hot day to realize how much shade helps. As it turns out, some of the siding is very cheap. What you see around the door and what's on the back of house that you haven't seen yet may be masonite. It's hjard to take off because it breaks apart. The wood siding on the garage is old wood and would be OK except for the mold. On the upside it's easy to take off. FYI – Making the mold be really gone is not that easy, especially when you live where mold loves being. Just covering it up with the Hardie paneling is not a good idea. When wet weather comes, the mold blooms. We need the mold to be gone. Now, look above the door. See that roof? It's not got enough slope. That's why there is so very much mold in this area. We are waiting for a roofer to come. Our consensus is that we need a professional to make that part of the roof do its job. We're guessing that the roof needs rebuilding. It looks like a $1500 jpb don't you think? If that takes care of the water issues it will be money well-spent. The old siding is no longer there. You can see two 4'-8' Hardie panels on the left, on the garage. We can't do much more here until the roofer comes. Chris and Steve also got this small soffit up. It may not look exciting, but it's better than what was there. We have 2-3 weeks of hard work ahead. None of us has time for this. But when it's finished, we will look with pride at the end result. You might be wondering why it is that Steve and I are part of our son's remodeling project. I'll tell you why… it has a lot to do with my father. That man did stuff. Daddy had tools and skills. There was not a home repair that was off limits. When Steve and I could, we helped with his projects. We happily help our kids with their projects. Steve is a better worker/helper (more upper body strength and tool knowledge) but I do add something to a job. I like to think of myself as foreman but really I'm the one who says 'keep at it'. And I think Steve might say that I can have a good idea. But mostly my job is keeping us moving forward. I may not be loved at all times. I can live with that. This entry was posted in Notes from a quilter and tagged Hardie, remodel, siding by Becky Goldsmith. Bookmark the permalink. I am always so very impressed by the real support your family gives each other Becky. Words and even money are sometimes relatively easy to do but the actual work…well the Goldsmith’s are an inspiration. (although with all that education bet there is lots of ‘discuss’ too! I sure hope you all wore respirator type masks when taking down the moldy siding. I’m sure you dont want to hear my “hospitalization-in isolation-lung infection-traced to removing moldy siding from a horse trailer” story. Iknew you guys couldn’t spend a Summer laying around the pool, goofing off! I think I see a second career for you two, “Goldsmith Remodeling”!! Good luck with this project and I love the picture of your mom and dad! When you spoke of this project a few days back, I kept wondering why does she pick SUMMER… but I guess with Chris in grad school, summer is a slow time. I have decided to do an outside “job” at my place. I am going to paint the front door…. after removing the rubbrey paint that has bubbled and bubbled and bubbled… I am sure it will be a 2-3 week job as I am only working when the sun is out back and all the paint is going to have to be sanded off.. it has been this way 8-9 years… the neighbors are going to love YOU. Its not odd! Its the way normal families work together and help each other. It is the way I grew up. From the earliest age I can remember carrying logs when dad helped cut down trees with my grandfather. We(as a family) always did our own labor. 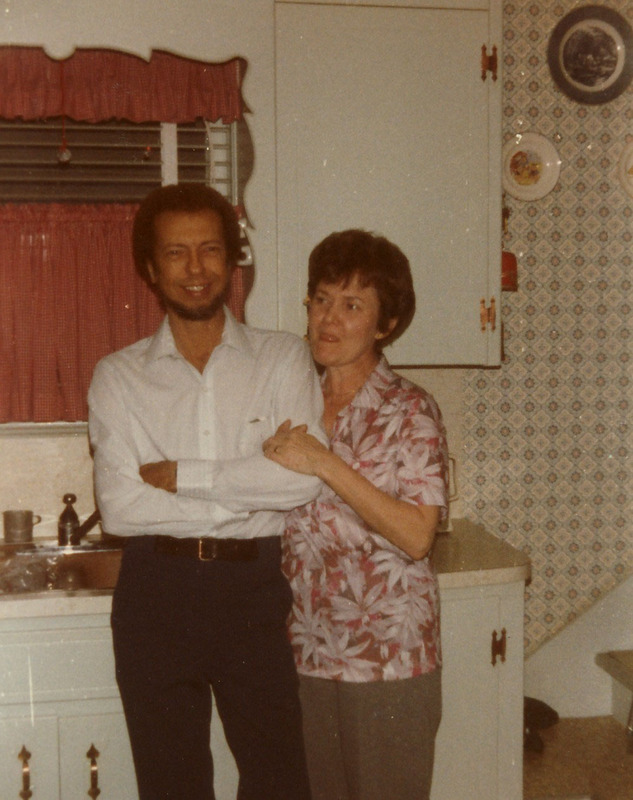 When I bought my home a condo, my mom, dad and I spent month renovating before I even moved in. I stayed with them for months until I bought it, just as they had stayed with my grandparents. Now that my sister is getting married they have started helping with their son-in-laws to be house. Women can work just as hard as men. Good for you and your husband! 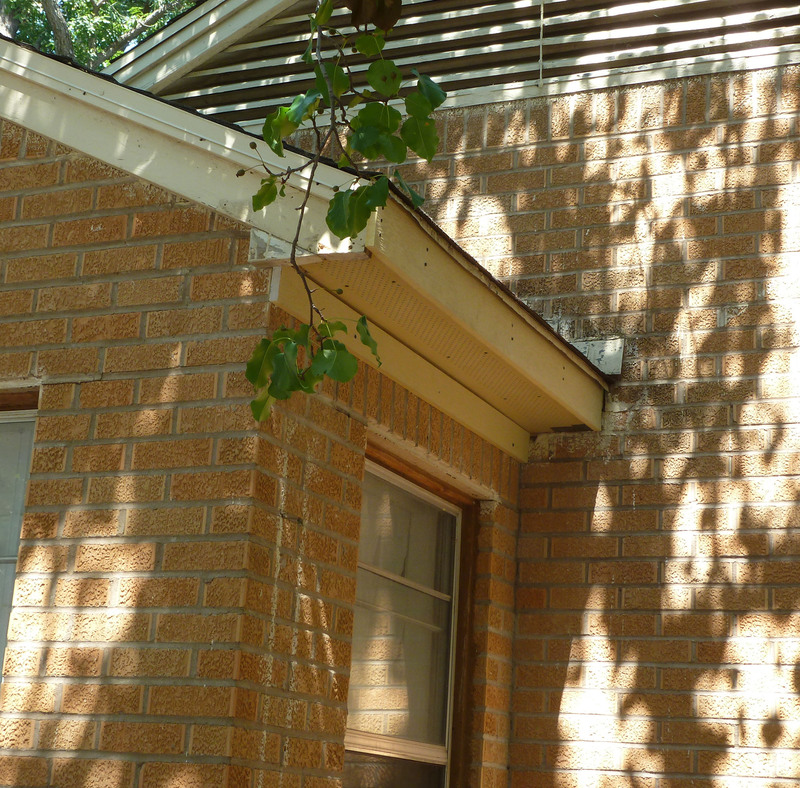 What’s the secret to replacing soffits? We have some dented ones due to when our boys were young and had baseball bats. It looks like we’d have to take all of them out to replace the few with dents…seems like a huge job. Yes, the shade sure helps in the heat! I agree with what Colleen has to say. Soon I wil be helping my son with his remodeling, although he lives an hous and a half away, so I won’t be as handy. $1500? I am pretty sure that around here, taking off the roof and rebuilding it would be a 5 figure job, not a 4 figure one. I have nothing but admiration for your hard work, though! It already looks way better. Take care of yourselves, though! I didnt t mean the whole roof. Sorry to be confusing. 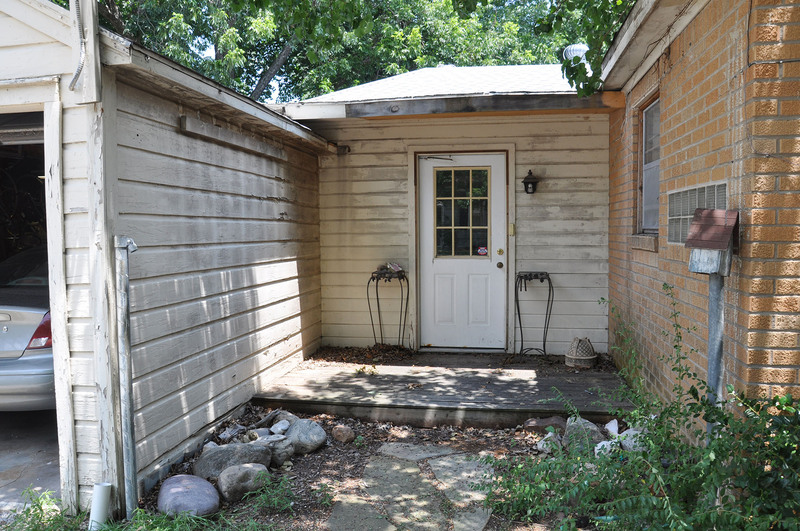 Its just a small flat part over the side porch. Replacing soffits isnt too bad. We went to Lowes and asked for pointers. When we took down the old ones we paid attention to how they had been installed. We put up the Hardie soffit boards with ventilation holes in them. They are thin but heavy. You need to get the right screws because they are concrete boards. The facing boards cover the ends of the rafters and any gaps below the soffit at the wall. It helps to have the right tools. Circular saw, table saw, drill and screw gun. And a ladder or two. That can-do attitude that you learned from your father and are passing on to your son and grandchildren is PRICELESS! Hard work and sweat equity are real bonding agents! I think that many of us quilters are ” craftsmen”. My husband always says that he believes I enjoy the “engineering” of my quilts as much as the sewing and artistic design, and I think that he is right. It’s good to see a woman quilter do these things. I too love the outside jobs, I believe in my other like I must have been a carpenter or gardener. I love moving things around for a better design,just like designing quilts. Enjoy your blog very much. I’m impressed. It does seem like quilters have great abilities to do this type of work. I just finished helping my dh stain concrete floor in our restaurant Huge job but great feeling to have finished it. I’m going to get to quilting now! Love love the family stories! Read about your whole renovation. You did a great job, but be careful on that roof. Nice, nice work on everyone’s part. Impressive job! And congratulations to you, Becky, for keeping up with the boys; not all women can do such work. Anyway, any updates on the roof? Did you push through with your plan to rebuild it? The side porch is a job well done, by the way.